If a villager has a cow in his courtyard, he is well aware that the main condition for obtaining good yield is complete feeding. When an unbalanced diet, the quality and quantity of milk is greatly reduced. Depending on productivity, a dairy cow needs 70 kg of balanced feed per day. For ruminants the feeding amount based roughage: hay, straw, haylage (chopped hay). The necessary succulent feed: the root - and tuber crops, silage and green grass, cereals and legumes. To increase the yield, it is necessary to include in the diet of concentrated and mixed feed. These include animal feed with vitamin supplements, meal, waste grain, vitamin and mineral supplements, bone meal, etc. Hay for animal feed should be of good quality, have a pleasant smell, does not contain fungi and rot. Straw and grain waste will need prior preparation before feeding: they need to be shredded and steamed with hot water, add mineral supplements. These foods filled with the digestive tract of animals and are easy to digest. Silage and silage – a valuable fodder to significantly increase the productivity of cows. No less important role played and juicy foods: beets, turnips, carrots, potatoes. The breeder must not forget about the need to clean the roots of dirt and grind them when eating large tubers animal in danger of choking, this is especially significant when feeding fresh potatoes. Since the basis of the feed is hay, you want to prepare it in abundance: one adult horned animal per day 3-5 kg per 100 kg of live weight in the range of 10-15 kg per day. The amount of feed required for feeding one day, must be multiplied by the number of days the stabling period – you will get the total required feed. Straw and chaff will need to give the cow for 5 kg per day per head. The rate of 8-12 kg of silage per day; for silage standard – 3-5 kg per day. For roots there is also a standard: fodder beet, potatoes 15-20 kg, carrots – 10-12 kg, sugar beet 5-8 kg. A special place in the feeding of cattle is concentrated feed. The best basis for them are forage crops: oats, wheat, barley. It is necessary to carefully monitor the quality of feed – grain zaplesneveluju dangerous to the health of cows. There is a simple calculation of the number of the feed: for every kilogram of milk should be fed 2 kg of grain feed. 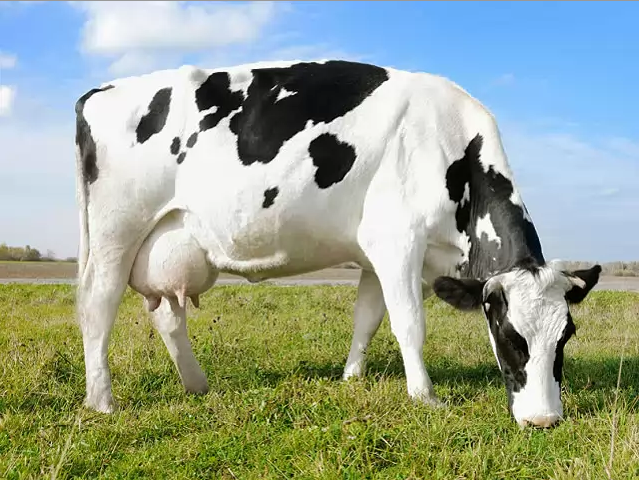 In this case, the cow receives sufficient nutrients so as not to lose body weight and not to reduce the amount of milk yield. It is recommended to give them pre-prepared as and bran. You will also need to give the cow Vostokstroy chalk and flour. Animals need to feed 2-3 times a day, distributing the daily norm in equal parts. Necessary for animals to water in sufficient quantity, but not less than 30-40 litres per feeding, the temperature should not be below 8-10°C. you Need to ensure cows and regular exercise in the fresh air. A prerequisite for successful cattle keeping provides a good sanitary condition of the farmyard. Fulfilling all these requirements will allow you to obtain a good yield and preserve the health and productivity of Cows for many years.